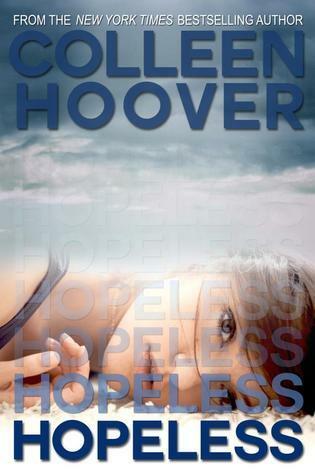 In my quest for more books in the New Adult genre, I stumbled across reviews of Hopeless by Colleen Hoover and found myself intrigued by the repeated praises. Hoover took me on a journey filled with suspense, romance and intense revelations that left me breathless. From the first page I was drawn into the character's world and quickly found myself emotionally connected to them. I laughed; I cried and in the end I gave a little piece of my heart to them. The tale begins with an intense scene and I was immediately hooked by the raw emotions. The scene is gripping and the need to know unmerciful. Delivered from Sky’s point of view we are then propelled backward two months and each chapter is dated and timed. Sky, is seventeen and although she has done a lot of kissing she does not really feel any connection to the boys. Her best friend is going away and she will be entering public school for the first time as a senior after being home-schooled. On a shopping trip to the local grocery school she meets Dean Holder and for the first time we see her flustered and experiencing waves of emotions. The tale that unfolds is absolutely captivating and oh so much more than a romance. It is full of dark intense secrets and I loved every minute and every word as Hoover held me spellbound. I immediately felt attached to Sky on so many levels. Despite her “kissing” promiscuity she is really a good girl and quite the homebody. She has lived a very sheltered life as cell phones; computers and televisions are not present in her home. *gasps* She is a reader and thus we connected. She is witty, brave and gives good tude'. She is complex and troubled on a deep level and I loved unraveling her. Dean “Holder” is smexy, intense and fills a room when he enters it. My first impression was bad boy but he constantly did things to make me question that. As the tale unfolded I quickly feel in love with this emotional, charismatic, and funny young man. Her bestie, while not present was sweet, and true. At school she makes friends with Brecklin whom I adored. His witty humor added to the tale but I wish he were more present. He could totally hold his own as a MC. *hint* All of the characters see growth and enhanced the others. The depth of emotion they bring had me laughing, crying and rooting for them. Wow, where to begin explaining my feelings for this novel and author? Hopeless is complex and so much more than a romance. It reveals dark subjects, pain, lies, and secrets that took me by surprise. Hoover reels you in and makes you live and feel each moment. My emotions went on a ride from; happy, to concerned, to anger, to tears and love. The author does a wonderful job with ebbs and flows slowly revealing things and then giving us precious moments of profound love to absorb the details. The characters became very real to me, and at times I could barely breathe. I have said before that I am always chasing that “book high”, where the lines of reality blur and for a moment I live and breathe the world I am in; this is Hopeless! The title is perfect and I fell apart a little as I it sunk in. The plot is tight, believable and brilliant and the way the author brought it all together felt genuine and surreal. The ending left me with hope and I closed the book feeling spent but calm. Hopeless #2 is to be told from Holder’s point of view and I am actually looking forward to getting into his head. Fans of contemporary romances, unpredictable plots, chick-lit, life, love and loss need to read Hopeless. Hoover is the author of the popular Slammed YA series, and despite raving reviews I actually hesitated in reading it; since YA contemporaries haven’t worked for me. I can tell you, that has all changed and I will be reading them. Auto-buy list cupcakes, auto buy list. Thanks for the great review Kimba, for those of us who don't really understand what New Adult Contemporary mean, could you enlighten us. Oh, my. Just a stunning review, hon. You've made me all sloppy-eyed and I haven't even read it yet. I'm so glad you love Hoover she's something else, isn't she? I bought this one, and I am trying so hard to get caught up on my review books so I can start this. I think this sounds soooo good. Awesome review. Great review, you have done justice to how intense and page-turning this book is. And good news Slammed is every bit as good if not even better! she writes wonderfully, the kind of book that grabs you from the onset and you cannot walk away. NOT YA which is why it worked for me, she turns 18, so we get no high school drama at all!!! It's all about the secrets, and mystery and oooh read it!!! How did I miss that...probably by skipping right down to the review section *headdesk* I'm not so tuned in to New Adult yet...but yes...I think it would work a lot better for me!!! YA Contemporaries don't usually work that well for me so I tend to shy away from them...this one has me tempted though. Another fantastic review Kimberly!! I thought this book rocked too... I was just as blown away as what you were. Holder is just beautiful, and I loved every moment of getting to know him. Where can Hoover go in the next book??? How can you top that? ?